The Season of Creation begins on September 1, the Day of Prayer for Creation, and ends on October 4, the feast day of St. Francis, the patron saint of ecology in many traditions. There is an urgent need to find solutions to the crisis facing our common home. Together, we are fulfilling our role as stewards of God’s creation. 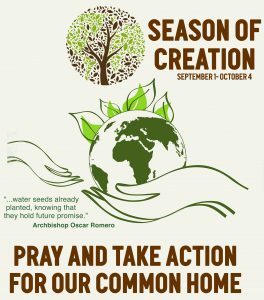 Visit the SSND International Website for more information about the Season of Creation. Explore Shalom – Integrity of Creation resources.